This is going to be a great summer for reading, if what has crossed my desk of late is any indication. 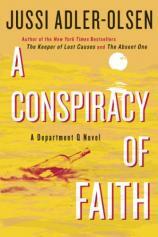 The latest entry in what is becoming a very crowded field of superlative thriller literature is A CONSPIRACY OF FAITH. This is the third and latest of the Department Q novels by Jussi Adler-Olsen to be published in the United States, thanks to the robust translation to English by Martin Aitken, with two additional books in the series having been published in Olsen’s native Denmark. Department Q is the red-headed stepchild of the Copenhagen police force, headed up by Carl Mørck, who, in turn, supervises the pleasant, brilliant and extremely enigmatic Assad and the prickly but nonetheless useful Rose. Q was originally created as an ever-extending bit of rope with which Mørck could hang himself, ostensibly while investigating all-but-unsolvable cold cases. But when Mørck and his charges began solving older cases as well as new ones, the department suddenly found itself on the receiving end of some generous funding, which naturally is constantly and consistently misappropriated by Mørck’s superiors. He accordingly has fairly free reign over his department, given that he is not above some implicit bureaucratic blackmail. "A CONSPIRACY OF FAITH is great reading, exhausting in all of the best ways, double-barrel loaded with a puzzling mystery on one side and an edge-of-your-seat, ticking-clock threat on the other..."
The interaction among the three members of Department Q, as well as the disastrous turns in Mørck’s personal life, might lead the uninitiated to conclude that they have stumbled into a lighthearted 500-page romp through a drawing-room mystery. Not so. Rather, the narrative pitches back and forth between Mørck’s somewhat sour and frequently hilarious observations of those around him and a set of dark and gruesome circumstances that chill the blood. Think of being at the wheel of an automobile, careening down a two-lane mountain road that is slick with ice: on this side, the comfortable and secure hug of the rising earth, while on that side, the terrifying consignment to eternity that one moment of inattention will bring. Things get rolling for Department Q when a bottle discovered several years before but more or less lost is brought to its attention. There is a message in the bottle, its lettering all but obliterated; it’s written in blood and speaks of an abduction. Clues are slowly pieced together utilizing intuition, science, and good old-fashioned dogged police work, as Mørck and Department Q come to slowly realize what the reader already knows: a fiend has been operating for decades in Denmark, targeting a certain demographic in the worst way possible and amassing a fortune. Meanwhile, a woman under the tight control of her husband finds that she can no longer tolerate his mysterious disappearances for days on end, or his reluctance to discuss the source of his considerable income. She begins going into forbidden rooms and looking through hitherto unexplored boxes, having only the faintest idea that each new thing she learns brings her closer to danger. Yes, she will not be denied. The primary police force is investigating a series of warehouse fires that has recently plagued the Copenhagen area, each of which has resulted in the discovery of an unidentified body that apparently perished elsewhere. It is Assad who discovers that the circumstances match those of a case from another jurisdiction that occurred some 14 years previously. Is it coincidence or something else? Mørck, Assad and an unexpected assistant work their grim magic on the cases, even as additional lives hang in the balance, and the past and present each hold solutions to puzzles that have laid long dormant. A CONSPIRACY OF FAITH is great reading, exhausting in all of the best ways, double-barrel loaded with a puzzling mystery on one side and an edge-of-your-seat, ticking-clock threat on the other, all served up by Mørck, who is (understandably) sour but nonetheless driven in spite of himself. You will want to read and re-read this book until the next installment is made available in the US.